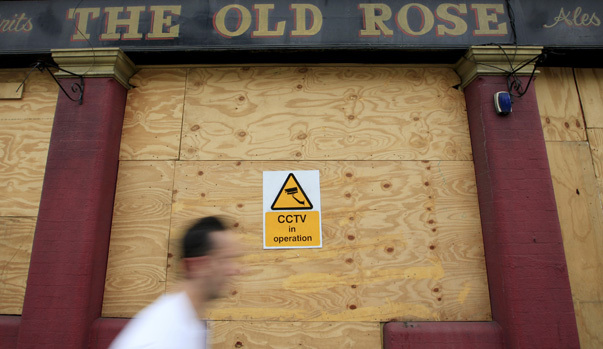 Are Muslims killing the great British pub? A government minister has become the latest parliamentarian to cause controversy by suggesting that the decline of the British pub is connected to immigration. Stephen Williams, who is the Lib Dem MP for Bristol West and Minister for Communities, told the House of Commons: “In my constituency, lots of pubs have closed, but it is usually because of demographic change. Is there a connection between an increasing Muslim population and pub closures? It’s important to note the context of Mr Williams’s remarks. A cross-party group of MPs, backed by pro-pub lobbyists the Campaign for Real Ale (Camra), are calling for a change in planning law to protect pubs. Campaigners want to see a planning application required before a pub is demolished or converted into a shop or whatever, giving local people the chance to object. The government says people can already protect pubs from closing by signing a petition to have it listed as an “asset of community value”. Ministers are resisting the idea of extending a new blanket protection to all pubs, because some are no longer viable. “It was a debate on planning policy and I pointed out commerce changes in response to population change,” Mr Williams said. According to the 2011 census, Bristol has the UK’s third biggest Somali population after London and Birmingham, with just under 5,000 people on record – although the local council thinks the real number is more like 10,000. Bristol city council notes that Muslims were the religious group that grew the fastest between the 2001 and 2011 census, with the percentage of the local population identifying as Muslim rising from 2 to 5 per cent. Nationwide, about 3 per cent of people in England and Wales identified themselves as Muslims in the 2001 census, and by 2011 it was 4.8 per cent. We’re not in a position to confirm or disprove Mr Williams’s local knowledge on pub closures in areas with high immigration. Neither can we definitively prove Lord Hodgson right or wrong. The problem is that, while various statistics show that pubs are closing across the country, we don’t have data that goes down to the level of individual neighbourhoods. We can’t say whether there is a correlation between pub numbers and the local Muslim population in a small geographical area. 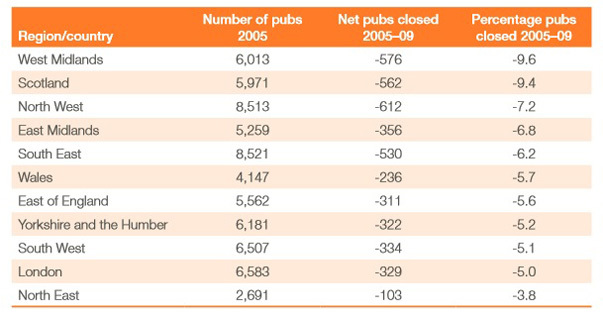 There’s little dispute that Britain has been losing pubs in recent years, though different bodies publish different estimates. 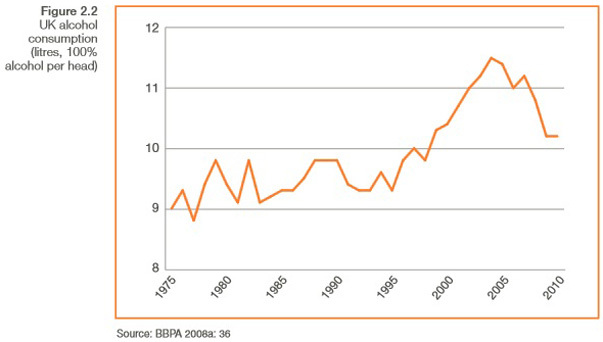 The British Beer & Pub Association (BBPA) says there were about 48,000 pubs in the UK in 2013, down from 59,000 in 2004. Camra says there are just over 54,000 pubs still serving across Britain, but warns that pubs are currently closing at the rate of 29 a week. No one is able to break the figures down at the level we need to compare with changing demographics at the neighbourhood level. Camra sometimes publishes figures by region, which shows that pubs are disappearing across the country at a similar rate. Various think tanks have looked at the issue and come up with a number of possible reasons for the trend, including: the 2007 smoking ban, the economic downturn, the availability of cheap supermarket alcohol, planning laws, changing social norms, the greed of the big pub companies. There is fierce disagreement about the biggest factors, but no-one who has taken a serious public policy interest in the shrinking pub market has put forward the rising Muslim population as one of them. Chris Snowdon of the pro-free market Institute of Economic Affairs, who recently published a paper on pubs, told us: “I don’t think that changing demographics have affected pub numbers for the simple reason that immigration, for the most part, has supplemented, not replaced, the native (drinking) population. The think tank notes: “There is a causal link between alcohol consumption and economic growth, showing falls in UK alcohol consumption that correspond with the economic recessions of the early 1980s and 1990s. In other words, a rising Muslim population would only affect the national pub industry if it meant there were a lot more non-drinkers around, but it seems that there are more drinkers in Britain than there were 30 years ago. And economics, not demographics, appear to explain the ups and downs best. While drinking is up in the long-term, beer consumption has fallen and more of us are buying beer in off-licences rather than pubs, according to the IPPR. We can’t discount the possibility that pubs in some neighbourhoods have closed thanks to the changing demographics of the local population. But we also can’t find any data that supports the theory that an increase in the Muslim population of some UK cities has led to falling numbers of pubs. It remains purely anecdotal. The fact that alcohol consumption has risen in the long-term in Britain suggests that the “Muslim hypothesis” cannot explain nationwide changes in drinking habits. It’s not a notion that policy experts have generally taken seriously. There are plenty of other more plausible, evidence-based theories about why the UK pub trade is in trouble, though arguments continue to rage about the biggest single factor. But if an area becomes predominantly Muslim, then that’s EXACTLY what happens. The pubs close! That doesn’t mean that pubs in predominantly non-Muslim close because of immigration. Immigration is not the cause of pubs closing all over the UK, just the pubs in predominantly Muslim areas. Has anyone considered that THAT is what the honourable gentleman was saying? Could you please explain why pubs are closing in the bradford area where i used to live, on second thoughts i have answered my own question -The influx of muslims. Having worked in the club and pub scene for over 30 years as a charity DJ, the decline is all due to the governments policy of taking orders from another country namely Belgium. The smoking ban and the high prices being put on alcohol are the main reasons the pubs are closing. Immigration has nothing what so ever to do with it. The British way of life has been decreasing steadily for years and the only people to blame are our government for removing the “Great” out of Britain. UH? The ban on cigarette smoking & the high prices have nothing to do with the EU. Duties on alcohol are almost uniformly lower in the EU & neither the rates nor the prices are harmonised. No are we required by any EU law to ban cigarette smoking in pubs. (I assume you mean the EU rather than Belgium, as I doubt whether the Belgians have any influence on British policy whatsoever). And personally, when I see the disgusting antics & violence of people who drink too much in town centre pubs at weekends, I’d happily see the price of alcohol be a lot higher. And I’m also pleased that I don’t risk getting lung cancer when I go into a pub. It may be that drunken, loutish behaviour and poisoning the air with tobacco smoke is what made Britain “Great” – but if that’s so, not being “great” seems good to me. There is a correlation between ‘Muslim’ areas and traditional ‘working-class’ areas, both being at the lower end of the social scales. The ‘working-class’ areas contain the highest proportions of smokers hence, when the smoking ban struck in 2007, they stopped going regularly to their local pubs. That is clearly reflected in the overall alcohol consumption data. The closure of pubs is far more about the smoking ban that any other factors, not Muslims, not supermarkets, not tied-houses – it’s just that their best customers have been forced away. Don’t neglect the “smoking Ban” as a major cause of pub closure! The Lib-Dem MP wasn’t blaming the general travails of the British pub industry on a rise in the Muslim population; he was merely commenting on his constituency, on a limited geographical area. Yet Fact-Check have investigated another issue entirely – the general problems facing the industry as a whole. And it has done so simplistically, equating the quantity of booze consumed per head with the number of drinkers and assuming that all types of alcohol consumption are equally associated with the public house. That “Fact-Check” chose to examine this issue at all is indicative of just how over-sensitive it, Channel 4, and much of the country, are to any suggestion that either immigration or anything associated with Islam could be associated with any development which might, from any point of view, possibly be deemed negative. I’ve never run a pub (although I once had a room above one), but I have lived in both Cardiff and in East London, as well as in the West Country, and I can tell you that, while the pub trade faces problems everywhere, there’s less demand for a public house in a mainly Muslim area, because most people there are genuinely teetotal – and even those who do privately indulge in alcohol consumption often don’t want to be seen to do so. It’s only common sense that if a smaller proportion of locals, all otherwise potential customers, are prepared to drink alcohol, then it will hurt the local pub trade. You would have to be a little bit mad to argue otherwise. Consequently, then, there are fewer pubs in Poplar than on the Isle of Dogs. There’s no reason why this should be deemed controversial, or why the Lib-Dem MP should be made to feel self-conscious, except a bizarre over-protectiveness on the part of the Factcheck team. 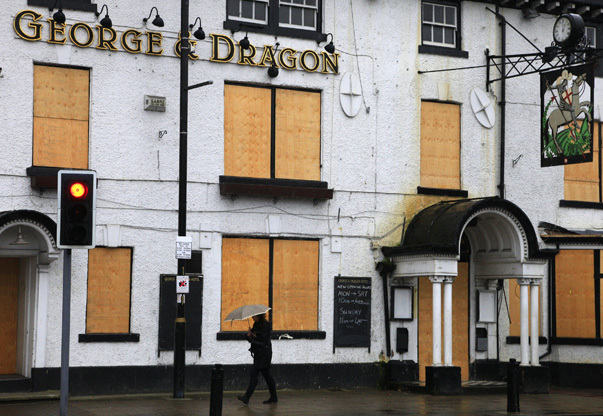 The George and Dragon Public house in Cheadle, Cheshire – (as featured in one of the pics.) – reopened last year !! The census, LSOA and other ethnicity data would suggest that the greatest concentration of people of Somalin origin is an area stretching from “St Jude’s” along Stapleton road into Easton proper and over through Lawrence Hill and Barton Hill. Like every where else in the UK we have seen pubs close but this is a UK wide problem. I actually think we have one of the best selection of pubs left in the UK and I haven’t even included those found in neighbouring districts such as St Pauls, St Werburghs, Redfield or Old Market. I am shocked that the writer can’t see parallels between this and the loss of independent businesses to the far richer chains that can afford to sell cheap booze and keep up with costs. Further, the old pubs used to be focal points in communities and neighbourhoods, a rootedness erased by the processes of gentrification. But the won’t point a finger in that direction, because it’s “too complex”. Instead, let’s just blame the muslims. Well, following on from Steven Emerson’s recent comments, I didn’t realise that I moved into a ‘no-go zone’ area – Birmingham. After eighteen years I have not been terrorised, abducted, attacked, beaten etc. and now it seems we might be a few pubs less off. The chain pubs seem to be surviving i.e. the Firkin pubs. Safety in numbers I guess. But the Evening cafeterias and novel restaurants on the high street generally have a very short shelf life. Free Houses have been forced to lower their prices to compete. They have far better ales but you have to be willing to pay for them. The students seem to enjoy getting plastered on double-vodka and Red-bull. It seems to be centred on getting mindlessly drunk as quickly as possible, and then off to a club. And this form of drinking spree generally precedes nine o’clock. You can imagine the state of them by about midnight. And as these pubs are just a red-bull can throw away the students, they head towards the cheaper chain pubs. Thankfully, I don’t live anywhere near them. As a nation we don’t really exercise much of a collective responsibility. Programmes are on our TVs every night tell us all about our good and bad behaviour so isn’t it about time something serious is done about? Most “locals” have turned into right seedy, smelly dumps you wouldn’t want your dog to enter. Then again, “Muslims” get blamed for everything else so they might as well get blamed for the demise of alcohol addiction centres. I bet this news sends enterprising brewing companies scurrying to scan the Koran for an interpretation of late opening licences. Me, I wouldn’t go near a Brit pub if I was paid to. Disgusting sticky carpet dives the lot of them.